APT's new Russia River Cruising brochure will see the company lead the way in Russia in 2015, according to the award-winning luxury cruise and tour operator. The new program offers guests the opportunity to blend their itineraries to combine first class river cruising with luxury land tours throughout Central Europe, the Baltics, Scandinavia and Finland, and private rail journeys aboard Russia's most opulent train, the APT-owned Golden Eagle. Russia is one of APT's fastest growing destinations and the new APT Russia River Cruising 2015 brochure reflects this fact, offering 140 percent more inventory compared to 2014. Guests can choose from 17 itineraries. At the heart of the new program is APT's new river ship, the MS Anastasia, a vessel undergoing a multi-million dollar refit and refurbishment ready for her maiden voyage in May 2015. "We've deliberately designed the Anastasia in such a way that she will redefine Russian River cruising. She will be the most luxurious vessel to grace Russia's waterways by far, bringing the exceptional style, standard and service so familiar to guests who travel with us on other European rivers, to our Russian itineraries. We want the entire experience, whether onboard our ship, or on shore, to be unforgettable and that's what our new itineraries will deliver." · Café Volga – a selection of freshly made-to-order café-style dishes. Other features include an expansive Sun Deck, outdoor lounge with ice cream bar; Heated pool and two whirlpools; the Anastasia Spa; the Hermitage Lounge and Bar; 24-hour tea and coffee bar; and outside balconies on 70 percent of suites. For its new Russia program, APT has designed a portfolio of land journeys for small groups of 30 guests. All feature a portfolio of luxury hotels. New for 2015, APT is offering an 14-night luxury Berlin, Warsaw and Baltics land journey through Germany, Poland, Lithuania, Latvia, Estonia and Finland. Highlights include a private and exclusive performance of Chopin in Warsaw, High Tea at The Regent Hotel in Berlin and a chocolate workshop in Old Riga. Also available are land journeys in Scandinavia and Finland, comprising 15 nights exploring Denmark, Norway, Sweden, Finland; a nine night land journey through Lithuania, Latvia, Estonia and Finland; and an 11 night land journey through the Czech Republic, Germany, Poland and Hungary. Guests can choose to travel in Silver Class Cabins, Gold Class Cabins or Imperial Suites. Travelling aboard APT's luxurious Golden Eagle train, journeys include a 15-day Trans Siberian Express itinerary between Moscow and Valdivostok; a 13-day Naadam Festival itinerary from Moscow to Ulaanbaatar; or they can combine any of these itineraries with a 13-night river cruise aboard the MS Anastasia. APT's most popular itinerary is 14-day Russian Waterways from Moscow to St Petersburg via the Volga, Svir and Neva Rivers. Priced from $7,795 per person, twin share. APT 'Signature Experiences' include the chance to explore the open air museum of wooden architecture on Kizhi Island, a cooking demonstration and lunch of regional specialities in a traditional Russian restaurant; and a spectacular ballet performance in St Petersburg at the world-famous Hermitage Theatre. Included in the price of an APT Russian river cruise is: all meals on board at all restaurants; a choice of staterooms and suites, many featuring outside balconies; all Freedom of Choice™ sightseeing and Signature Experiences; tipping, airport transfers and porterage; and all soft drinks, wine and local beer with lunch and dinner onboard the cruise. 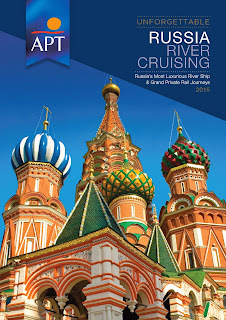 APT's Russia River Cruising 2015 brochure is available now. Call 1300 196 420, visit aptouring.com.au or see your local travel agent for further information.